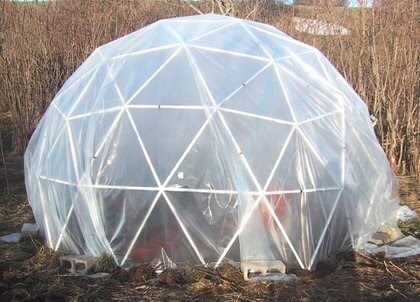 I've always loved the look of a geodesic dome, and lately, I've wanted a greenhouse. 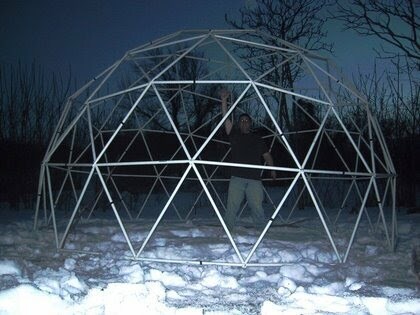 One of my friends mentioned he wanted a dome, and found some plans online. 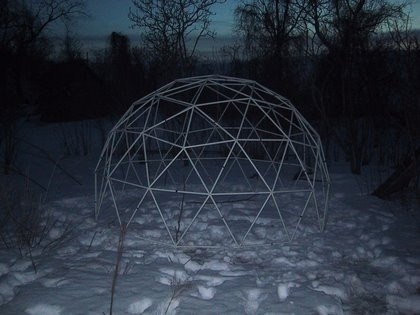 I started researching, and became convinced that I could build a geodesic greenhouse for only a few hundred dollars. I was right! This dome cost me around $300 including the plastic, the frame, the bolts, the rebar, and the cinder blocks. Most websites focused on metal conduit, but that looked like to much work. I decided on 3/4" PVC. 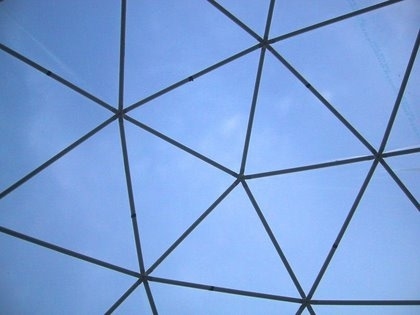 I used the calculator on Desert Domes.com to calculate the strut lengths. 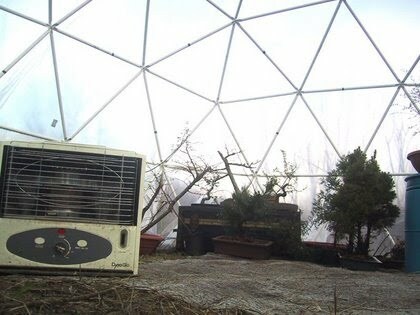 My dome is a 3V. I kept changing the radius until I found one that would produce 3 pieces per 10 foot length of PVC with little or no scrap. Don't forget to add 1 inch to each side of the calculated length. This length is the distance between the bolt holes, not the full length of the strut. I found another website with a great way to connect the PVC struts together. PVC Struts First you cut a flat spot where the bolt hole will go. Then you cut a radius which reduces the stress at that point. He did it with a band saw, but I don't have one, so I had to improvise. 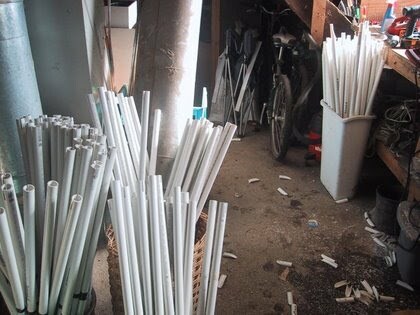 First go to the local mega-construction-mart and buy 55 X 10 foot lengths of 3/4" PVC pipe. I bought almost every piece they had. 1" is more expensive but also more heavy duty if you need it. 3/4" was $2 so that is $110. These will need to be cut to length. You need 80 of the long ones, 55 of the medium ones, and 30 of the short ones. Since these include 2 extra inches (one for each end), the distance between the drill holes are 2 inches less than the length. We did them 3 at a time on the radial arm saw and used a stop to set the length, rather than measuring every time. Start with the 80 long ones. If you take a 10 foot length, and cut 2 long ones, the piece that is left over is exactly the right length for a medium one. Keep them sorted. I built 3 jigs for this project. The first is one to cut the slot. I set my radial arm saw up with a width and a stop to cut the slot. 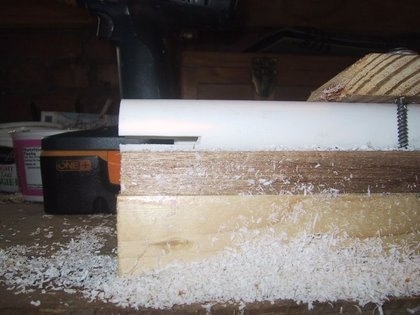 You just hold the pvc against the wood, press in until it stops, and pull it out. 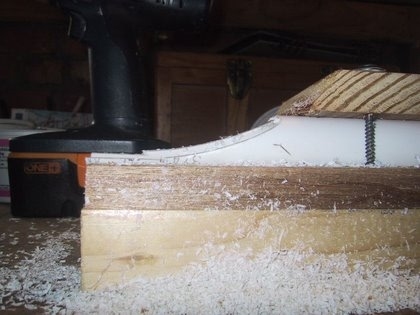 I just set the blade in the slot, started cutting, and turned the blade to create the radius. Finer teeth on the saw make better curves, but coarse teeth cut faster. Narrow blades are better than wide. 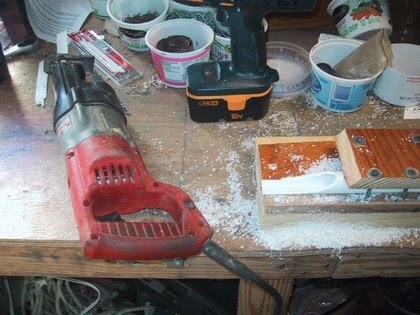 Here is a shot of the jig with the Sawzall. Remember that you have 165 of these struts to make and that's 330 ends to cut, so you have to do this as quickly as possible. A helper handing you struts and doing odd jobs is very beneficial. We got this jig dialed in so that you could just loosen one screw, switch the pipe, and tighten one screw and it would hold. Use the adjustment collar on your drill to set the torque to 10lbs or so. Speaking of 165 struts, here they are. They come in three lengths for this design. We marked them with tape to avoid mistakes. Masking tape for the short ones, electrical tape for the medium ones, no tape for the long ones. 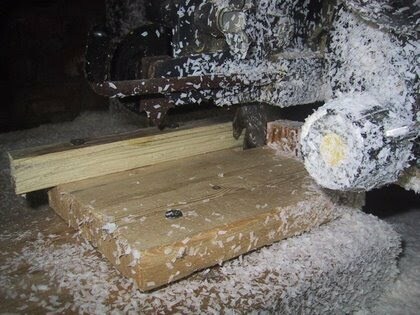 Here is a picture of the hole jig. The jig holds the strut with the curved cut part facing down. This makes it easier to measure, since it is a completely flat surface. To measure and drill the ends, we used a measuring stick (you can see it in the picture above). We cut the stick to the exact length we needed and then just made marks on the pipe. You just put the measuring stuck up, mark, and drill. With 330 holes to make, it took us 30-40 minutes. As I said above, the holes are 2 inches closer than the length. 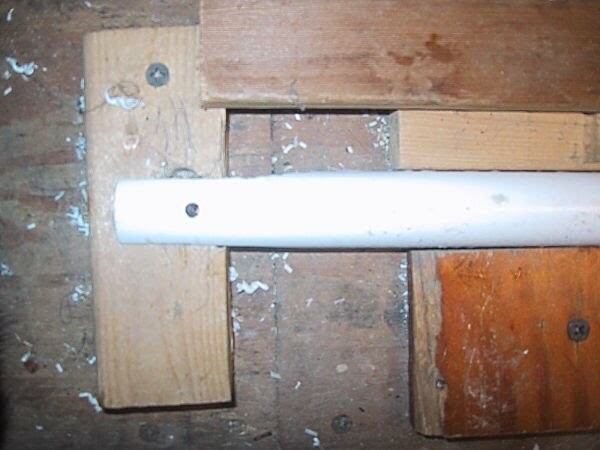 Here is a shot showing the hole, 1 inch from the end, with some more jig details. Desert Domes has an assembly diagram to show you how the pieces go together. I didn't take pictures of assembly, but the basic idea is to start with the top. Assemble the 5 point pattern and the first ring around it. 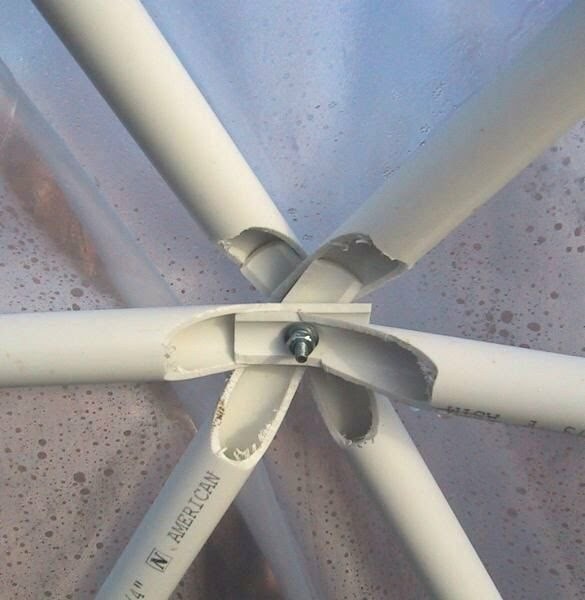 Then you add struts around, creating the next "ring" at which point the structure becomes rigid. You can then lift the whole thing, and start the next "ring." There are two basic types of joints. 5 point joints and 6 point joints. The 5 point joints just go together any which way. The six point joints are a bit more tricky. They fit together much better if you can overlap the pieces that are opposite of each other, since they line up. See the picture. If you just put them on any which way, you might not even get them on to a 2" bolt. Tighten the nuts on the top part of the dome about half way through construction, or you will need a ladder to do it later. Don't tighten the joints too tight, just snug. I finished the frame just at dusk on the third day of work. It took about 12 hours to do the struts and 4 hours to assemble it. Here it is! And a picture of me inside to give you some idea of the scale. It's 10 feet tall and 16 feet across. 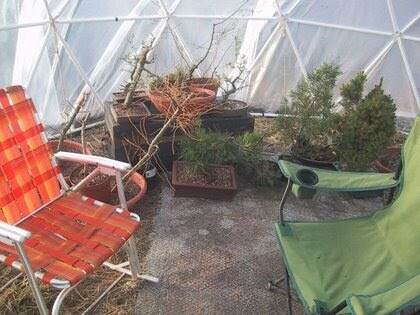 I ordered the plastic from Gothic Arch Greenhouses. I went with the 6mil IRAC plastic. 28 feet by 32 feet was $135 with shipping. I could have gotten away with 28' X 28'. 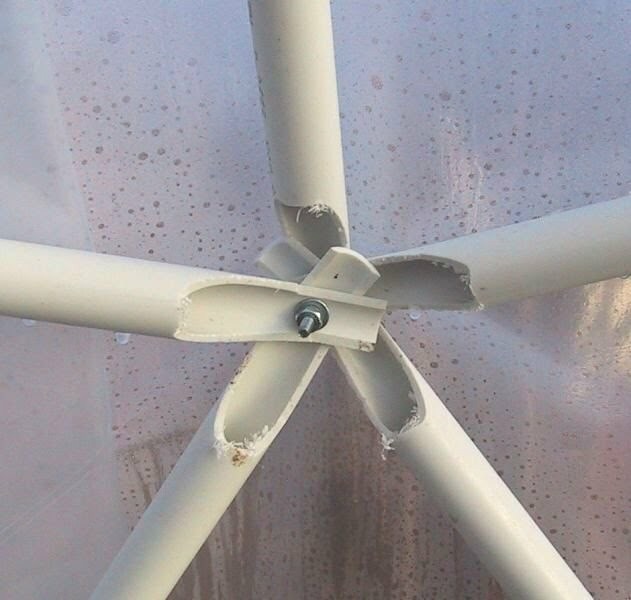 PVC degrades in UV, and you can only expect 2-3 years before it becomes brittle. 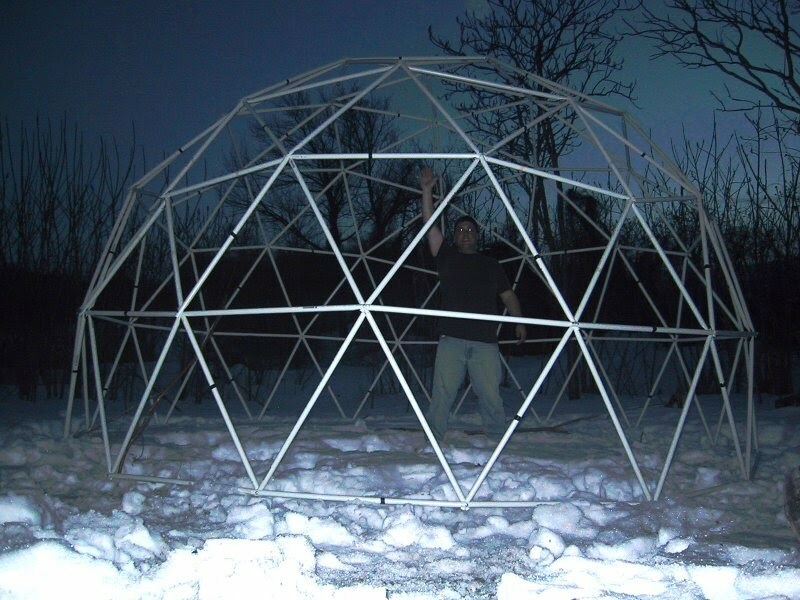 I don't want to have to do this again in 2 years, since it is a lot of work to make the dome. 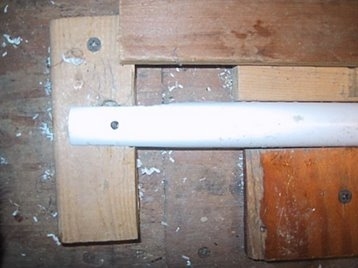 One solution I found on the web is to paint the PVC with house paint which has a very strong UV resistant additive, so that the paint lasts 10 years or more. The plastic covering I bought has a UV blocker in it, to guarantee that it lasts 4 years. This plastic has a "This side up" sign on it, so I assume that it is a coating that reflects UV. 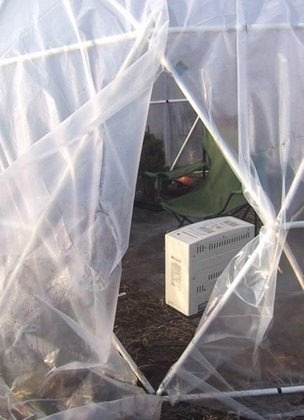 I expect the UV coating on the cover to protect the PVC pipes. The plastic is held down with 8 cinder blocks, one on every other strut along the bottom. 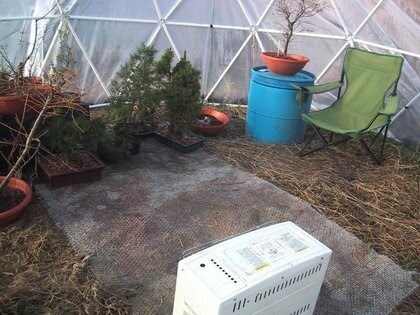 I covered plastic on the ground with dirt to keep the wind from getting under. 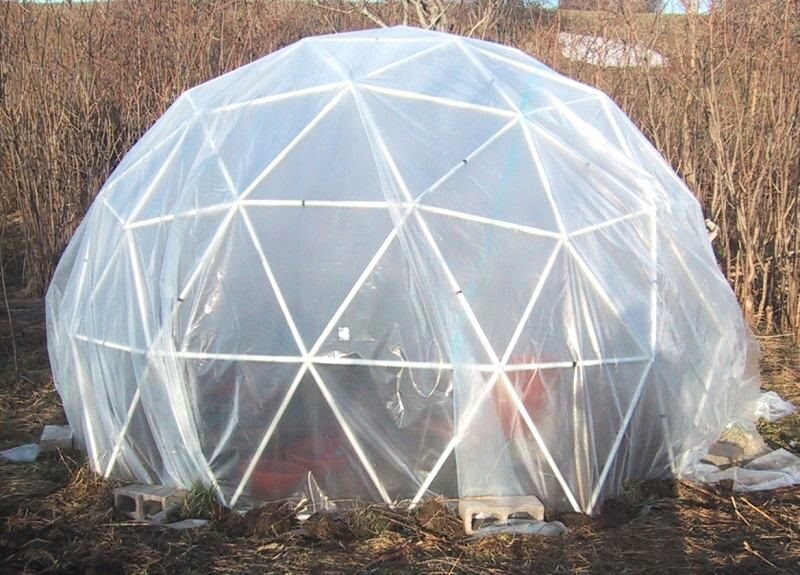 If the wind penetrates your dome, it can lift it right off the ground like a parachute. For added stability in the wind, I drove 8 pieces of 2 foot length of rebar into the ground and tied every other vertex to the rebar with strong rope. We studied it, and I was going to frame a door with PVC, etc. but my father said, "just take out that strut right there, and you'll have a fine door." Looking at 2 hours of work to make a door, I decided to try his idea. You have to bend down a bit to get in, but it works fine. Keep it simple. I just pull the plastic closed, and hold it with a brick. It was cold and rainy one day, so I moved my kerosene heater to the greenhouse. Works great, but leave the door open for carbon monoxide to escape. Here's a shot from the floor inside. You can see some bonsai in the background. One more. This is about 1/2 of the floor space visible. It's 180 square feet. That's as big as a 13X13 foot room. A shot with the camera on the ground looking straight up. I love the geometric pattern. One last shot from my house. 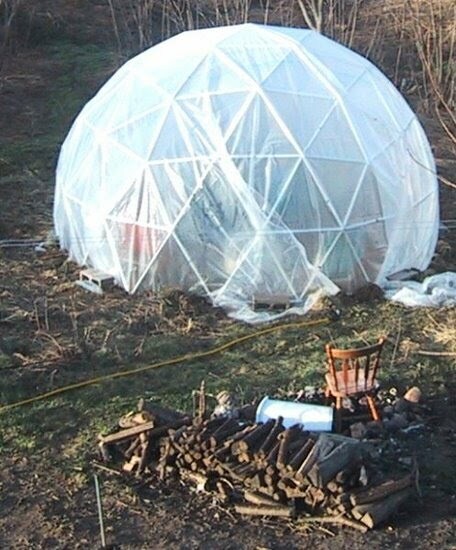 I have to move my fire pit, it's to close to the dome.